I’ve seen the recent news about some Instant Pot recalls, but thankfully the news doesn’t apply to mine! Whew, because I am loving my Instant Pot and have been having a great time exploring new recipes. Last week I was excited to discover a delicious Turkey Bean Chili that is super easy and extra healthy! But my best discovery to date is vegetable broth! For years I’ve tried to make a good vegetable broth, but have never been able to make one that really tasted like anything … until now! 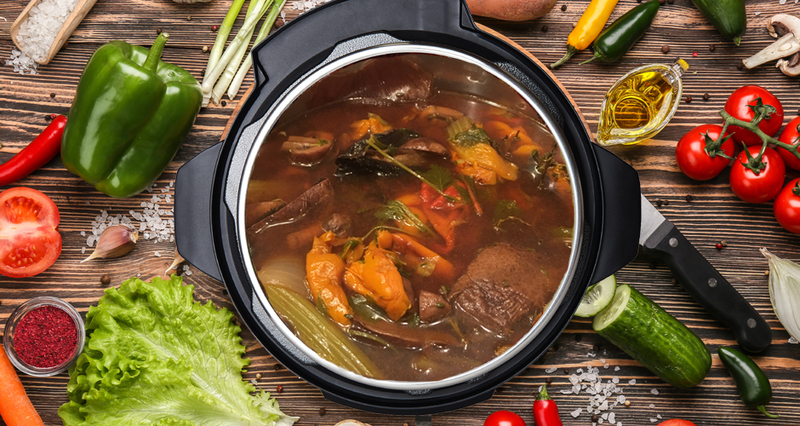 I found a few recipes online, added a few modifications of my own, and with the help of the Instant Pot, was finally able to create a rich, dark and flavorful vegetable broth (I just wish i yielded more actually broth!). As I’ve shared in my blog a few weeks ago, I love just drinking the broth – warm and so filling – but it is also a great base for other soups or any dish that calls for a broth or stock. So, if you’re like me and would really rather use something homemade, without all the salt and bad stuff, give this a try! Toss vegetables, garlic, and herbs with oil in a large flameproof roasting pan. Roast, stirring occasionally, until golden, 35 to 40 minutes. If your short on time, simply saute vegetables for a bit. Over medium heat, stir tomato paste into roasted or sauteed vegetables and cook, stirring, 1 minute. Add wine and boil, stirring and scraping up brown bits, 1 minute. Pressure cook (on soup/broth setting) for 15 minutes. Strain stock through a fine-mesh sieve into a bowl, pressing on and then discarding solids. Note - you can keep the stock, chilled, for about 1 week, or freeze it for up to 3 months. I am the Queen of kitchen gadgets, but have held back on this one, despite the fact that all of my teacher friends are going nuts over them. Now, I can’t stand it any longer. I want an Instant Pot! There is nothing better than home-made stock and that vegetable stock recipe looks great. I keep the ends of vegetables used in cooking (like carrots, celery, onions) in a zipper bag in the freezer. As I cook, I just add to my scrap bag and when it’s full, I make broth with some additional items based on preference. LOVE my instant pot! Makes the best baby back ribs in just 25 minutes! A nice treat while the BBQ is away for the winter! I’m in!!! … There’s nothing quite like great Vegetable Broth, and the ingredients in this recipe are inspiring me to rush home after work today to make this. Do you recall approximately how much broth it yields? Thank you, Mary Beth!